To cool down the engine, a coolant is passed through the engine block, where it absorbs heat from the engine. 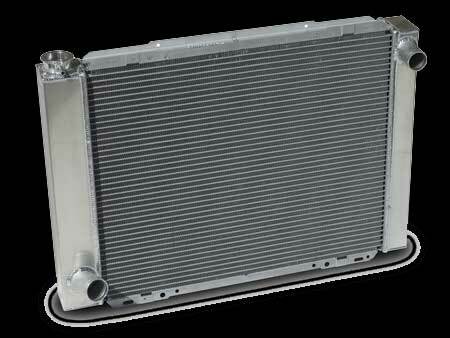 The hot coolant is then fed into the inlet tank of the radiator and distributed across the radiator core. As the coolant circulates through the radiator tubes on its way to the opposite tank, it cools again. The cold coolant is fed back to the engine, and the cycle repeats. As it circulates through the tubes, the coolant transfers its heat to the tubes which, in turn, transfer the heat to the fins that are lodged between each row of tubes. The fins then release the heat to the ambient air. Fins are used to greatly increase the contact surface of the tubes to the air, thus increasing the exchange efficiency. Up to the 1980s, radiator cores were often made of a copper (for fins) and brass (for tubes, headers, side-plates, while tanks could be made also of brass or of plastic, often a polyamide). Starting in the 1970s, use of aluminium has increased, to take over the vast majority of vehicular applications. The main driver for these application is reduced weight and cost. However, the superior cooling properties of Copper-Brass over Aluminium makes it preferential for high performance vehicles or stationary applications. In particular MW-class installations, copper-brass constructions are still dominant.